2X3.5 Magnets – How are they Popular with Businessmen and Well-Wishers? As you all know a business card is one of the most popular promotional items in the world today. They have been around for a long time and they largely remain affordable for businesses in all budget sizes. Perhaps a business card is the first marketing collateral that a businessman gifts to his prospective customer. A business card is made of lightweight material, which not only makes it cheaper, but also vulnerable to disposal and dismissal. However, this problem can be avoided by gifting them a business card magnet 2×3.5. You will be surprised to know that this is also the size for a regular magnetic business card. According to some studies, full color magnets are becoming a regular feature in 70% homes in and around the USA. People are going to retain full color business card magnets as a reference token and a refrigerator art on refrigerator doors of their home. Many people believe that magnet advertising cost bombs and is not worth trying. However, that is not true. 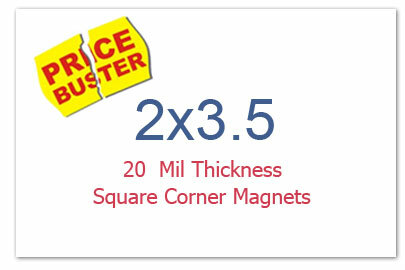 2×3.5 magnets are largely popular because people can afford them. Additionally, many online stores are stocking them offer exciting discounts on bulk orders. So, the next time, when you have something special to share, do not hesitate to stick by 3.5x 2 magnets. It is perfect for wedding announcements, birthday announcements, baby shower announcements and many more. People would love it for that small, yet intimate and overpowering feeling that it generates. Do you wish to announce your holiday sales effectively and persuasively? Do not look further resort to these business card size magnets 2×3.5. Perhaps this goes with the understanding that you are not trying to stuff lots of information to boost your sales. You can make impressions with crispy one-liners such as “Save 50% on Thanksgiving Magnets” or “Avail 50% Discount on Christmas Magnets” etc. For best benefits, you can always mail these colorful and enchanting magnets to your prospective clients and customers. Perfect for special business announcements year around. It largely remains affordable for small budget marketers as well as big budget marketers. You can avail discounts on bulk ordering these business card size announcement tokens from any reputed online store. As you might be aware that 2×3.5 is definitely not a size that will buy attention from longer distances, but it will surely turn heads at a closer distance. You can easily utilize them for popularizing your brand logo or any symbol. A full color logo or slogan will easily buy attention, when you are driving through crowded areas or when your car is parked in an overcrowded parking lot. Sky is the limit of imagination, when it comes to customized magnets 3.5 x2. You can seek them and utilize them in different capacities. Avail free online design proof, free art setup, free shipping, and free full color printing on purchasing these custom magnets 3.5 x2 from any reputed online store.